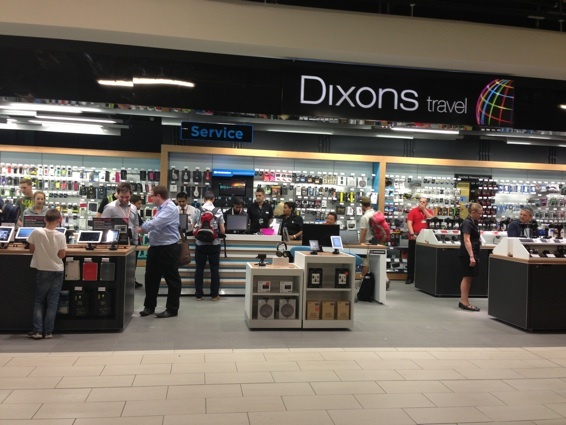 Electrical retailer, Dixons Retail, has unveiled the first in a series of new concept stores for its travel brand, Dixons Travel, at Gatwick Airport in the South terminal. This concept store will be the blueprint moving forward for other store designs in the Dixons Travel portfolio, Dixons said. Instead of offering traditional POS (point of sale), the new space features digital signage that shows the latest and greatest products and allows customers to easily browse for more information. The new store is reported to have been designed with the weary traveller in mind, with a more open and flowing feel and a shelf for tired customers to store their luggage whilst they pay for their purchases. The store will house 1,100 products across 1,466sq ft of space – from the latest in tech to favourite travel essentials. Tablet ‘look books’ (10in screens) will sit next to products allowing customers to gain more information on the products and associated offers in a more interactive and less cluttered format. The store launch also sees, for the first time, a Dixons Travel store fitted with a Knowhow bar, giving customers hands-on tech advice and repairs. Dixons Travel said it has also enhanced the in-store customer experience, utilising digital visual merchandising tables with 32-in rear projection ‘floating screens’ over specially themed areas, creating a theatrical atmosphere to the overall product floor. Ahead of the opening, the store team is reported to have received additional training to ensure the customer experience remains at the highest standard while in such a fast paced, high-tech environment. The Dixons Travel business is reported to continue to perform well for the wider Dixons group, which has recently opened international stores in Brussels, branded Knowhow, joining Copenhagen, Rome and Milan as international operations. 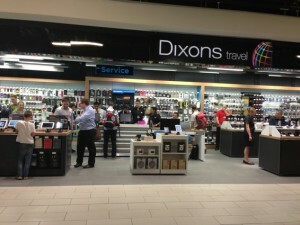 Visitors to Gatwick Airport will be sent a text message upon arrival offering them a £10 off £100 spend voucher at Dixons Travel in the South Terminal.